Sign advertising for Terrapin Trader. Hugh Garbrick/Mitzpeh. 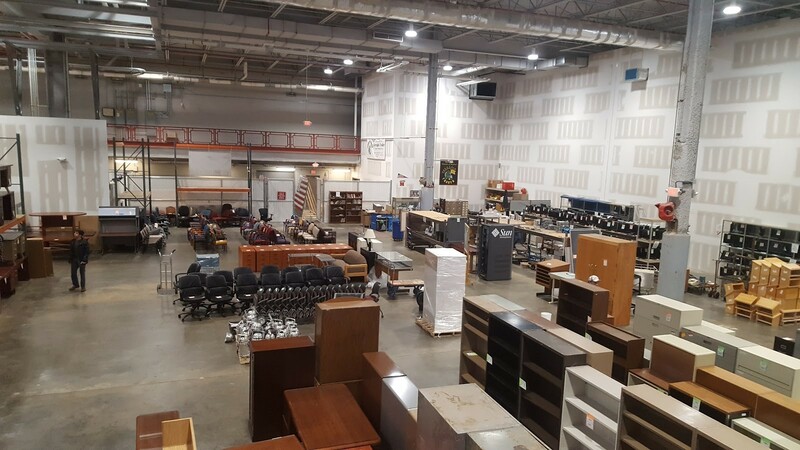 Used chairs, desks, computers, monitors, cars, file cabinets, chalkboards and other stuff from this university and colleges in the University System of Maryland may end up for sale at Terrapin Trader, located in the Severn Building off of Greenbelt Road. The place is full of surplus items that this university no longer needs, and if you still need to buy gifts for Hanukkah, Terrapin Trader won’t empty your wallet. To get to Terrapin Trader, customers enter through red double doors on the side of the Severn Building closest to the Metro train tracks. Then, they follow signs pointing to the store’s entrance, which is through a second door. 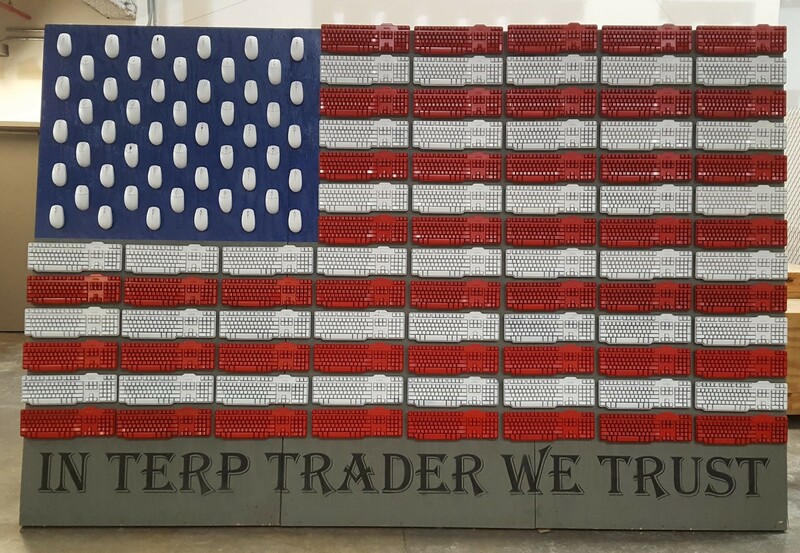 Customers know they made it to the Terrapin Trader once they see the giant mouse and keyboard American flag. Keyboard and mouse American flag in front of Terrapin Trader’s entrance. 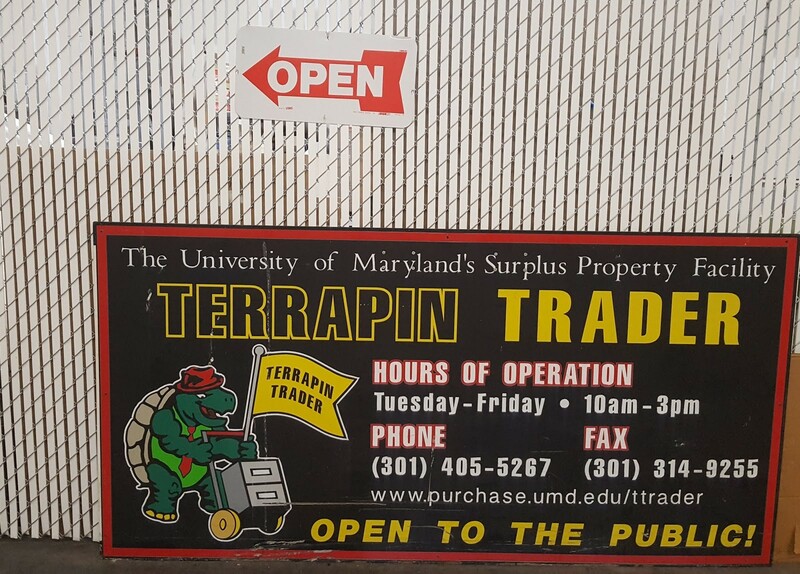 Terrapin Trader takes surplus items from colleges in the University of Maryland Systems, including this university, and resells them to the public and other college departments. Hugh Garbrick/Mitzpeh. Terrapin Trader, established in 1994, is open from 10 a.m. to 3 p.m. Tuesday through Friday. Employees, five full-time and four students, pick up surplus items from college departments, price them in the staging area and set them out on the floor for customers to browse. Mike Painter is the manager of Terrapin Trader and has been working there since it opened for business. “The main focus of this when it started was to redistribute capital assets within the university community. So, in other words the items would be here, so if they needed a chair, they could come down here and get a chair. If they needed a computer, they come down here and get a computer. So, there was a resource for used stuff which was cheaper than buying new,” Painter said. Carl Merica, a store keeper, has worked with Terrapin Trader since 2004, and compared Terrapin Trader to a consignment shop. A typical sale goes like this: a college department determines what items are surplus and gives them to Terrapin Trader, once an item is sold, some money goes back to the department. Usually about 80 percent goes back to the department and Terrapin Trader keeps 20 percent, according to Painter. The floor where customers can browse items for sale. In the right back are electronics like computers and monitors. To the left is furniture. There are also a lot of desks, file cabinets and shelves. Hugh Garbrick/Mitzpeh. Malcolm Snorden is a frequent customer. He goes in to browse once every week or two and said that he likes Terrapin Trader because of the deals on electronics. “I guess I’m a real bargain hunter. The amount of stuff that I’ve actually purchased from here, you know I can give you a list,” Snorden said. He said that he’s bought a projector “for no good reason other than it was really inexpensive.” He also said that his home office has monitors from Terrapin Trader that he bought for $15. Kevin Tuttle, coordinator of life safety equipment for UMD Facilities Management, has been shopping at Terrapin Trader for 18 years. He said that he’s bought vehicles, including a used truck for $750, computers and furniture. After purchasing something from Terrapin Trader, some customers will also resell or redistribute the used item. “There’s one guy right now, it’s a P.G. County teacher, that comes in and buys them [computers] and he refurbishes them and gives them to inner-city kids,” Painter said. Last year Terrapin Trader ran 859 pickups in their trucks collecting 23,938 items, according to Painter. He said that if word got out about Terrapin Trader it would be beneficial to the community. Terrapin Trader is not allowed to advertise because of the effect it could have on other local business, Painter said. Sign outside the Severn Building off of Greenbelt Road. The Severn Building is home to the Terrapin Trader, Severn Library and Facilities Management. Hugh Garbrick/Mitzpeh. Merica said that Terrapin Trader moved into the Severn Building about three years ago. Before that it was located close to the Maryland Fire and Rescue Institute, University of Maryland. Terrapin Trader is affiliated with this university through Procurement and Strategic Sourcing. 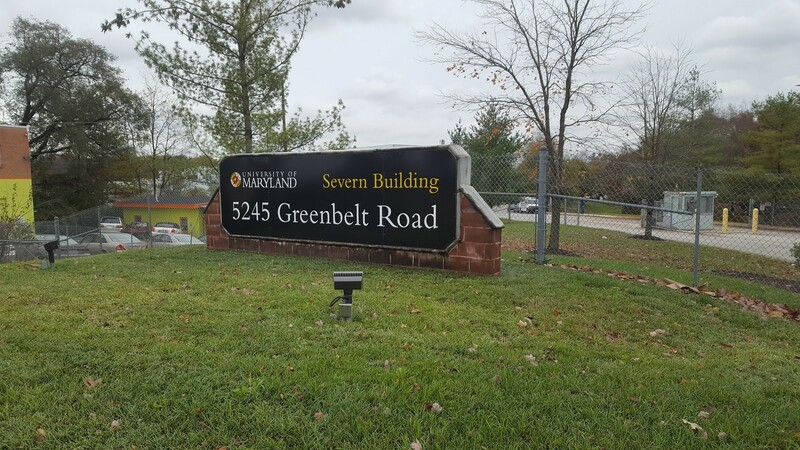 Also currently in the Severn Building is UMD Facilities Management, and the Severn Library, which has the capacity for 1.25 million volumes on 30-foot shelves, according to University of Maryland Libraries. The Severn Building used to be a Washington Post printing facility, according to UMD Libraries. No Replies to "Still looking for Hanukkah gifts? Terrapin Trader won't break the bank"